Cole Swensen received her B.A. and M.A. from San Francisco State University and a Ph. D. in Comparative Literature from the University of California, Santa Cruz. Her books include The Ours (Univ of CA, 2008), Goest (Alice James Books, 2004); Such Rich Hour (2001); Oh (2000); Try (1999), which won the Iowa Poetry Prize; Noon (1997), which won the New American Poetry Series Award; Numen (1995); Park (1991); New Math (1988), which won the National Poetry Series competition; and It's Alive, She Says. Her translations of contemporary French poetry include Art Poetic (1999, by Olivier Cadiot), Natural Gaits (1995, by Pierre Alferi), Past Travels (1994, by Olivier Cadiot), and Interrmittances II (1994, by Jean Tortel). Her work as a poet and a translator has appeared in many journals and anthologies. She is a Contributing Editor for American Letters and Commentary and for Shiny, and is the translation editor for How2. 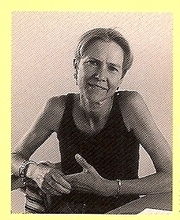 Cole Swensen currently teaches at the University of Iowa. Cole Swensen is currently considered a "single author." If one or more works are by a distinct, homonymous authors, go ahead and split the author. Cole Swensen is composed of 3 names. You can examine and separate out names.